The Blue Boy and Pinkie Wall Plaques - KW3504 Discounts Apply ! 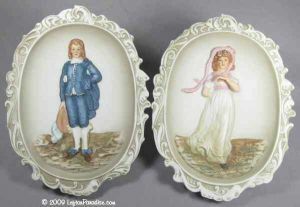 A beautiful pair of wall plaques depicting the The Blue Boy and Pinkie. Inspired by the famous paintings by Thomas Gainsbourough and Thomas Lawrence, these flawless plaques are 8 inches tall and are marked KW3504 with Lefton crown logo. They have an ornate scrolled border around a concave background.